As an entrepreneur, I've used 'little bets' throughout my career and would credit the strategy as one of the key factors driving the success of the Praetorian Group. 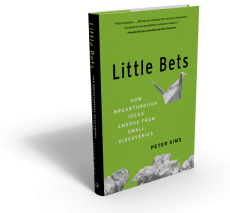 Peter Sims, a longtime business contact and friend, recently published a book - Little Bets: How Breakthrough Ideas Emerge from Small Discoveries - that explores the concept in depth. Peter does an exceptional job articulating not only how to use little bets but more importantly explores the mindset that needs to be in place to maximize their impact for both individuals and organizations. I found the book to be quite relevant for anyone in marketing and online media which is why I'm including my review on ThinkOnlineNow. From my experience, the message of the book rings true. Over the past 10 years, I've probably made hundreds, if not thousands, of little bets and can testify to the importance of the concept, having used them to navigate the dotcom crash, the recent recession and a rapidly changing media landscape. In the process, my company has become the leading online media company in our market and has helped drive the adoption of online tools and content for first responders worldwide. ‘Little Bets’ is not just about how to try a lot of things in the hope that something sticks, but provides a thorough roadmap for how successful entrepreneurs think about business opportunities and execute on new ideas. Sims also explains the broader context that needs to be in place to cultivate little bets, such as the importance of a growth mindset and building a learning organization that isn’t afraid to try new things and fail. In the process, he does a great job weaving in the psychology and science behind his concepts, citing a wide range of relevant research. Although I would have liked to have seen a few additional examples beyond the ones cited and perhaps more a more in-depth discussion of tactics for making little bets successfully, there's no doubt it’s an excellent resource and a must read for any entrepreneur, marketer or business manager. Check it out - www.PeterSims.com. I'm reading: Book Review: The power of little betsTweet this!